Another year comes to a close - Vikings! 2013 TRACK: No more updates are being made to this page - goto 2013 TRACK. Possible XC State Changes: Thanks to former Gunn HS coach Ernie Lee for figuring out the changes for next season. Please keep in mind that the following numbers are unofficial and definitely not set in stone. DI boys - CCS up to 3, SDS down to 2, DI girls - no change, DII boys - SDS up to 4, CS down to 2, DII girls - NCS down to 2, no one qualifies for the vacant spot. I don't know how this will be resolved, DIII boys - no change, DIII girls - SDS up to 4, CCS down to 2, DIV boys - SDS up to 3, NS up to 3, CCS down to 2, CS down to 2, DIV girls - no change, DV boys - SDS up to 3, NS down to 1, DV girls - no change. 2013 Resolution Run: 18th Annual Los Gatos Resolution Run January 1, 2013 (Tuesday) - New Years Day Starting at the Los Gatos High School Track at 9:00am 5.0 Miles to the Top of the Lexington Dam and Back Pre-Reg: $35.00 with shirt; $20.00 without shirt Race Day Registration: $40.00 with shirt; $25.00 without shirt Register at ATHLETIC PERFORMANCE in Los Gatos at 55 W. Main St. All Age Divisions - Awards to the Top 3 in each division Can register online at www.raceroster.com For more information - please call 408 354-7365 . YouTube: Amazing transformation of a guy who did not give up. Very inspirational. 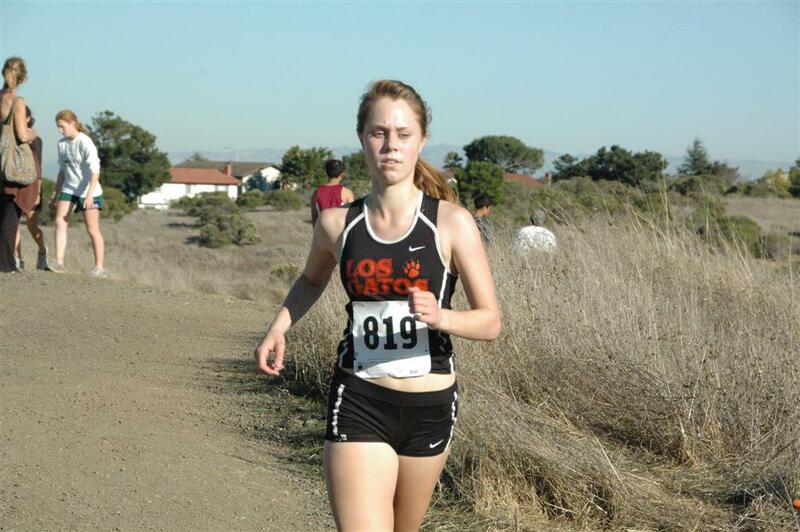 Ex-Los Gatos runner Katie Castro : wins the JC State Meet by 29 seconds (17:45) for the De Anza Dons, helping the team to a 4th place finish. 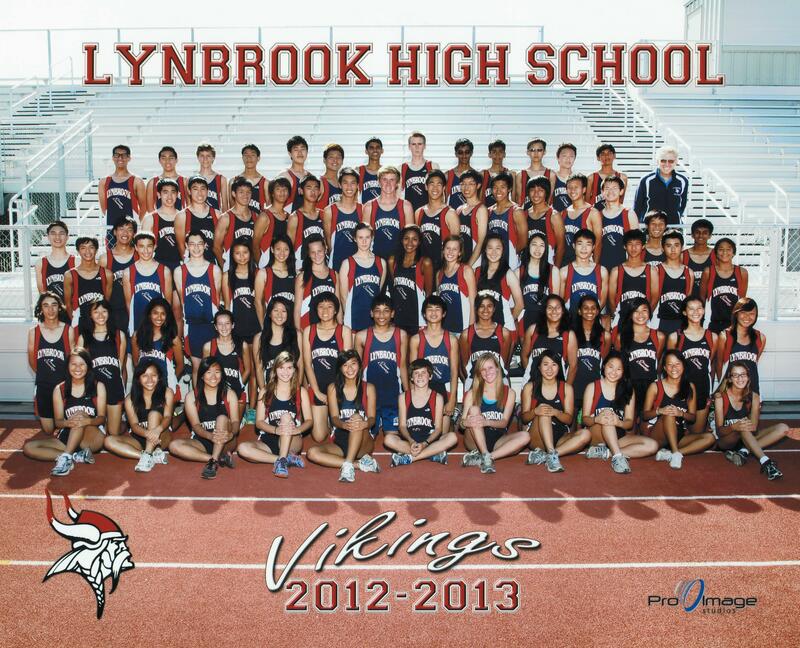 SCVAL Post-season Meeting: The post-season XC meeting will be held at Wilcox high school on Monday, 11/26/12, at 4PM. We will meet in the faculty lounge, which is just off the main parking lot. PA-USATF Coaching Education: USA Track & Field Level 1 Schools are the most comprehensive track and field training program in the nation, consisting of 21 hours of instruction focused on the events of track & field and related sport science. The course includes classroom instruction as well as hands-on training. The Level 1 program covers all events by emphasizing fundamentals, rules, safety/risk management, instructional techniques, in addition to specific event group training of endurance, sprints/hurdles, throws and jumps. NorCal Coaches Clinic: The 5th Annual NorCal Distance Coaches' Collaborative Roundtable. Asics Commercial: A pretty funny Asics running commercial. VS Athletics: West Coast Super Track Clinic - Feb 2nd, 2013. 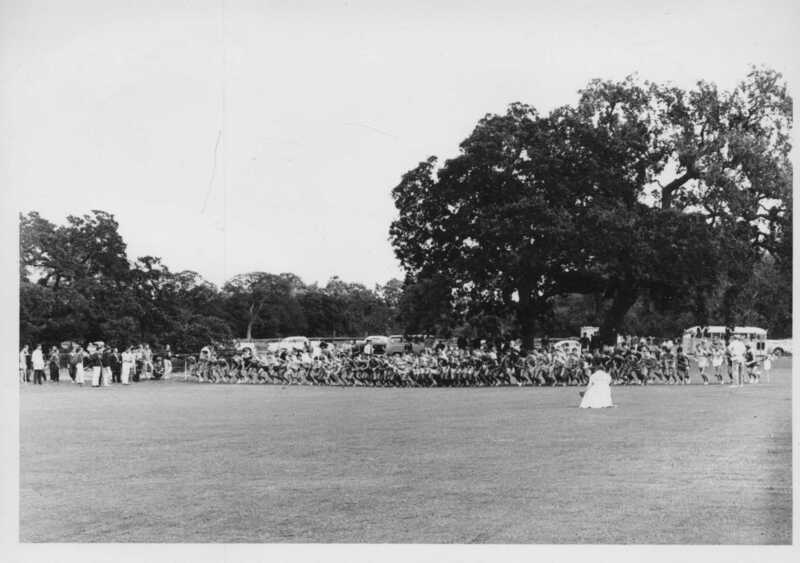 Lynbrook Crystal records: have been updated. Vikes, see how you line up with Vikings of the past. Dina Oakland (Mitty): Archbishop Mitty High School is looking for a pole vault coach for the 2013 track season. Stipend available please contact Head Coach Dina Oakland: doakland@mitty.com if interested. BAIAL JH Finals: Was I Star Struck today? Yes, it's not every day that your Finish Line Judge is THE Michael Johnson (200/400 Olympic Gold) at a Jr High XC meet - WOW. Monta Vista XC Cooks: A great Team Builder idea. SCVAL Combined results: Instead of two divisions of 7 schools, here is how the results might have been if run as one league of 14. Note in the combined results that Homestead could have won the VB if they had moved up some of their top FSB runners. 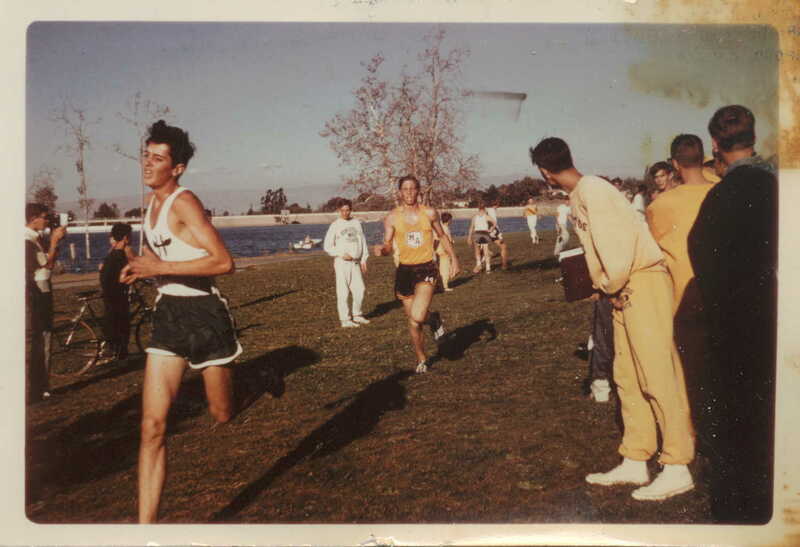 1979 Kinney (Footlocker) West: This was the meet where Ellon Lyons set the current Crystal CR (some footage is after the boys race). MtSAC Invite: MSAC results for NorCal athletes only. MSAC results for CCS athletes only. For us stats guys... Excel file of all races. 15251 total finishers (9020 boys, 6231 girls). Boys combined results and Boys combined Team results. Girls combined results and Girls combined Team results. If someone wants to go through the excel file and add the Sections for each school and email to me I will gladly run a NorCal, SoCal or any Section you want to create combined results, just let me know what you want. Monterey Bay Invite: Varsity Boys set a School Record on Toro Park at the Monterey Bay Invite. Campbell Octoberfest 5K: Jose Pina (Lincoln) outkicks Kevin Pierpoint (Asics Aggies) for a 15:36 win. Video of finish. Lynbrook Hash Run: Happened under cloudy conditions. The first "hounds" to get there were Anthony, Revanth & Rohit???. Ryan Sadjadi was the first to actually find me in my hiding spot (only 4-5 folks out of 60 actually found me). Earthquake Invite: New Zealand team that is coming to the Earthquake Invite this weekend. Meet Preview. 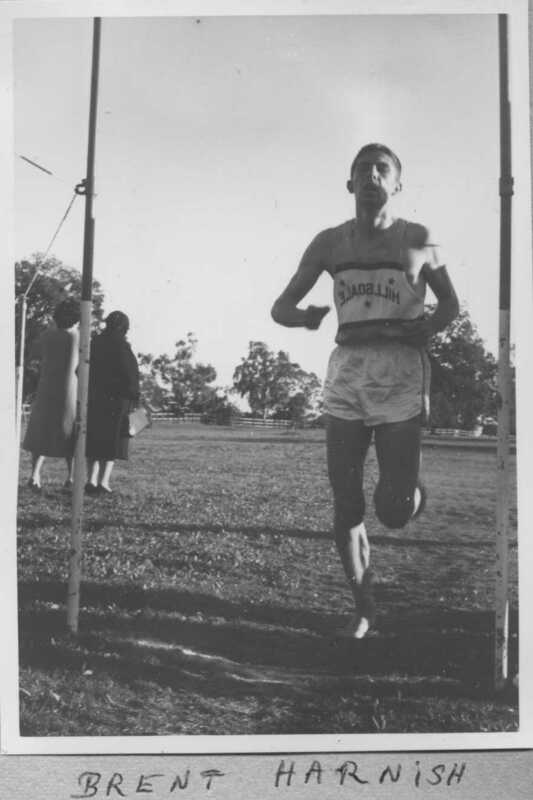 Lynbrook @ Stanford Invite: Amazing the stuff you kind find on YouTube if you take the time to look. Very nice video of the guys race at Stanford. SLV Girls: having a great time at Nike Pre-Nationals up in Oregon. SCVAL Crystal Preview: Has been re-scheduled for Oct 9th due to the heat conditions and not wanting to have to run an abbreviated course. 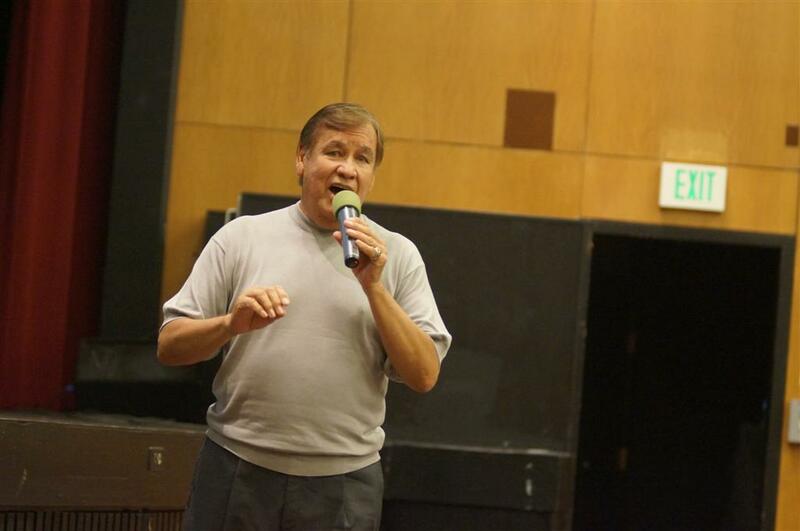 Billy Mills: the only American to win Olympic Gold in the 10,000 meters talks Wednesday at Monta Vista HS in Cupertino (Coach Kirk Flatow put it all together). Top CCS Coed Teams: Because I was bored I went and added this to the END of the list. Based on 3 guys & 2 gals and both teams genders had to have a qualifying ("Tracked") team time ranked (obviously only Coed schools are used). www.LynbrookSports.com: Is now on it's new server. 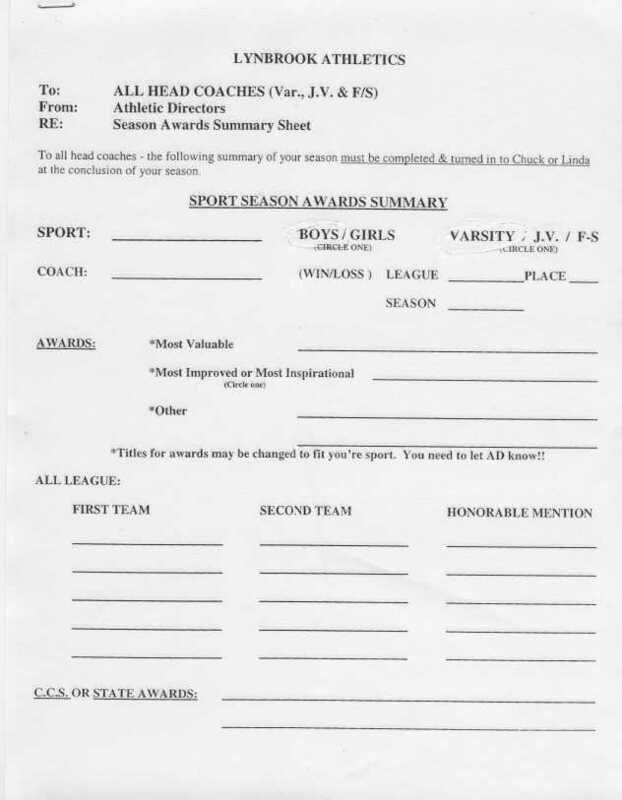 If anything is missing or doesn't appear to work, please email me at HANKLAWTRACK@GMAIL.COM. PrepCalTrack: When ESPN site finally goes dark... this is the site you'll want to go to for state wide results. SJ Mercury News: XC stories two days in a row - this is great. ESPN DyeStatCal server: Do you need access to all the OLD data and results? Click link on left if you need more than 3 years worth. We are currently using the back-up server, no other updates will be made on the ESPN server, go to www.LynbrookSports.com for the current info (you might have to clear your browser's history and cookies to force it to go to the back-up server). 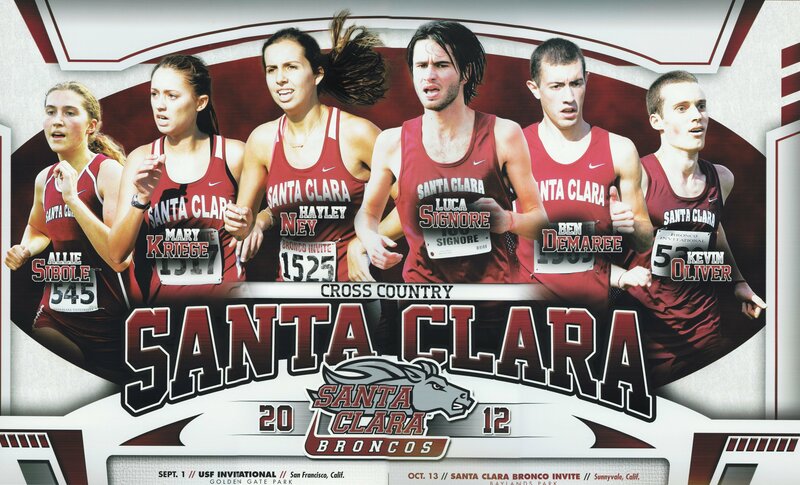 Santa Clara Broncos XC: Always good to see CCS athletes representing their colleges out on the trails. www.LynbrookSports.com: Folks, I will be going to my backup server Thur night for the unforseeable future so always be sure to use WWW.LynbrookSports.COM when trying to get to the current LynbrookSports site. I will set up a Re-Direct which will take you to the current site using that URL. Not all data will be available (last 3 years only) until this is all figured out. SJ Mercury News: Always nice to get an XC story in the news, this one covers PAL#1. Lynbrook Center Meet Pix: Grace Ling sets an age group course record (Tom Sanders also sets an age group record). Molly Haar (Mitty) wins the Senior Girls race and Yohaness Estifanos breaks Kevin Bishop's CR by 30 seconds with a 9:52.6 clocking. 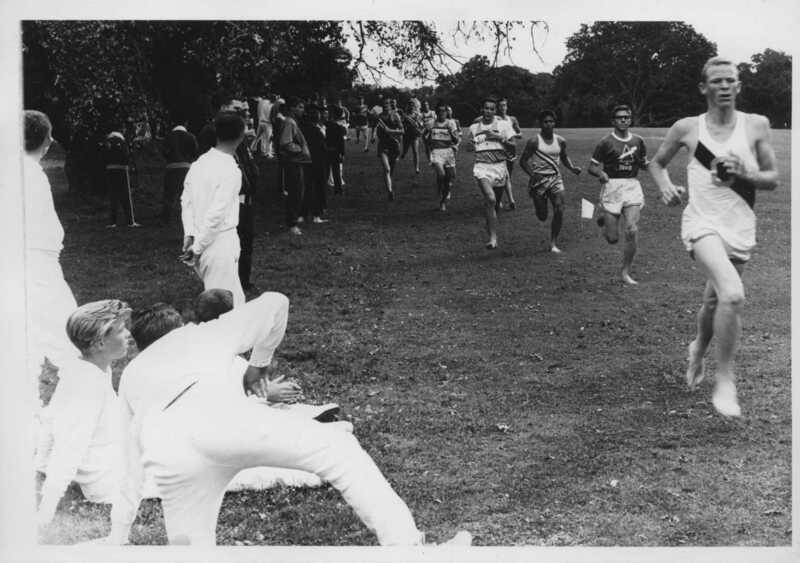 1974 NCAA XC Champs: Nick Rose is the long haired runner that won that day. Crystal Springs Schedule (as of 09/05/12): Check it out to see who is running when on the Crystal course. The Crystal Springs Handbook (revised) can be found here. Heat Illness Prevention (free course): Offered on the CIF website. Take it now since it's free (who knows, might become required in the future and then they might charge). Earthquake Invite: Last year it had a good showing for a first year meet and this year it has an added attraction. 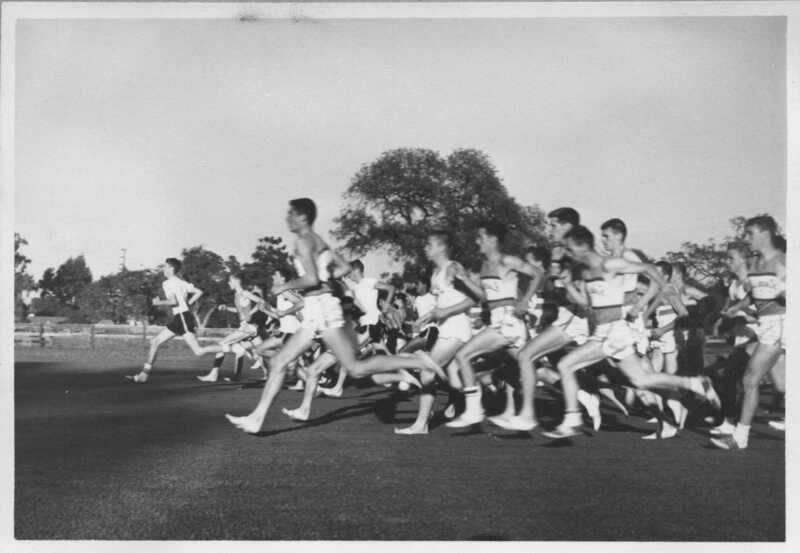 An all boys school from New Zealand (Auckland Grammar School) with a fine running tradition is bringing 28 guys and should put on a great show. Years ago they came to a small scrimmage meet in Hollister and Ibarra took NMC to that event. It was quite a fun event as the kids from New Zealand bring a great spirit and tradition with them not to mention some amazing runners that could compete with the best. They did a big chant and dance that created quite a stir among the local teams. Here is a picture of some of them with the NMC kids back in 2005. The meet will also have Madera South once again with their great crew from the Central Valley as well as other top local teams. 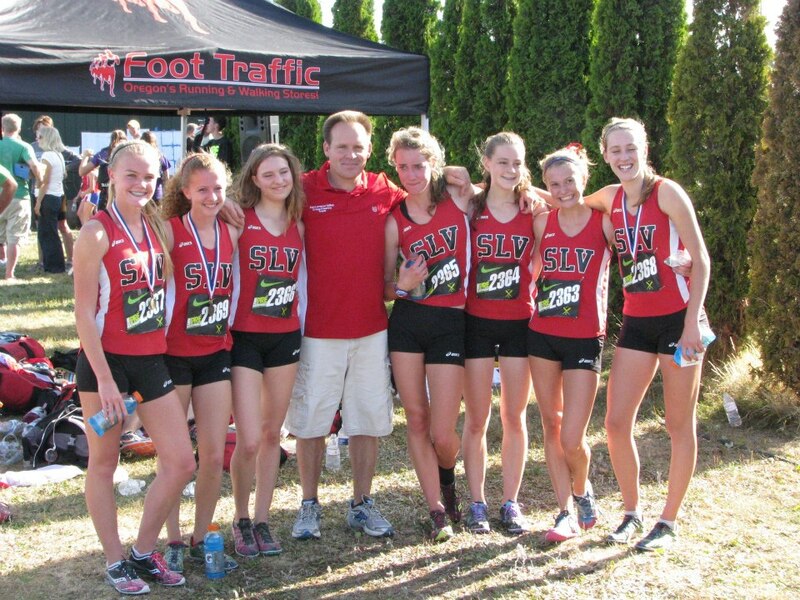 SCVAL Pre-season Meeting: The pre-season XC meeting will held at Wilcox high school in the Faculty Lounge on Tuesday, 9/4/12, beginning at 5:30PM. Please send any recommended agenda items to Walt VanZant. 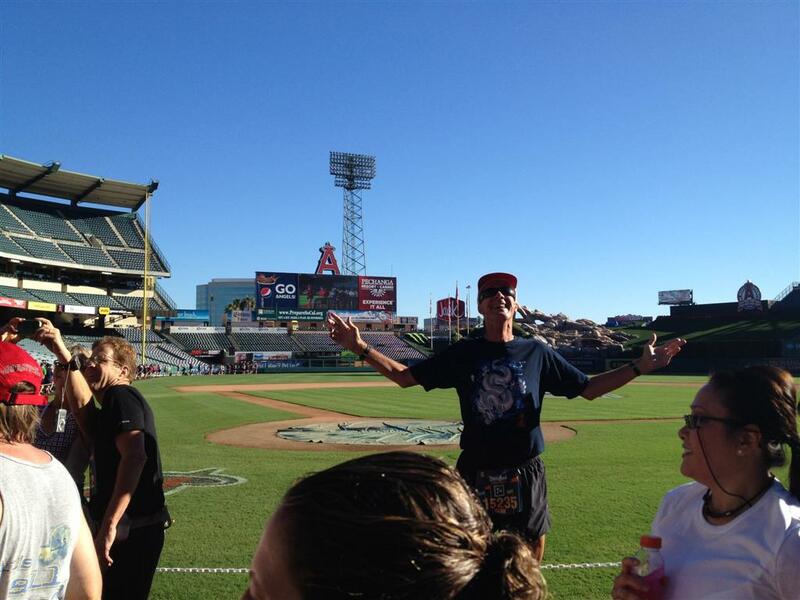 Disneyland 1/2 Marathon: On Home Plate inside of Angel Stadium (about 9.5 mile mark) - quads are SORE today. www.LynbrookSports.com: Folks - DyeStatCal has been hosting the LynbrookSports site for the last few years but ESPN is closing down DyeStatCal (and I think LynbrookSports) but I'm not really sure what will happen in the next few days. So always be sure to use WWW.LynbrookSports.COM when trying to get to the LynbrookSports site, I will set up a Re-Direct which will take you to the current site using that URL. If DyeStatCal does go dark, I doubt I will be able to re-direct from that site so always use the www.LynbrookSports.com URL, not all data might be available until this is all figured out. 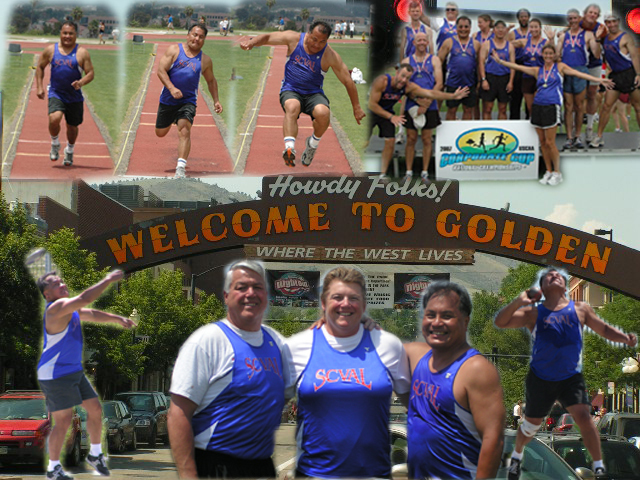 Jim Marheineke: Junipero Serra High School is seeking applicants for the position of Assistant Track and Field Coach. The candidate must have coaching experience or a competitive background in track and field and knowledge of one of the following event groups: throws, sprints, and/or jumps (high jump, long jump, and triple jump only). Collegiate experience in track and field as well as knowledge of meet management is preferred. A competitive stipend is available. The applicant should be able to attend practices Monday through Thursday at 3:00 p.m. and Fridays at 2:00 p.m., plus Wednesday dual meets and weekend invitationals. Screening of applicants will begin immediately and continue until the position vacancy is filled. All inquiries should be made to Jim Marheineke, Head Track and Field Coach � jmarheineke@serrahs.com (650) 345-8207 x 527, or Dean Ayoob, Athletic Director � dayoob@serrahs.com (650) 345-0991. 110HH - NOT! : I wouldn't recommend trying to hurdle this way. 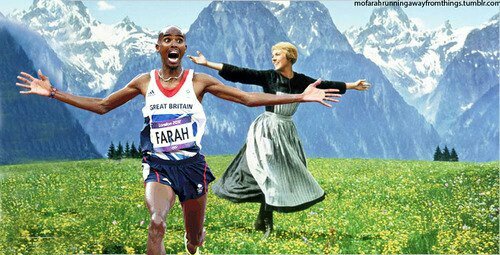 Olympic take-offs: Mo Farah & Forrest Gump. Pix: Summer pics can be found here. 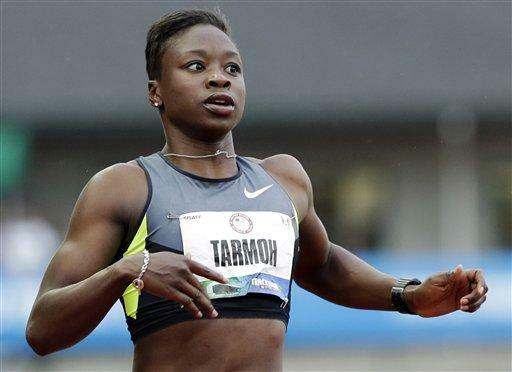 Jeneba Tarmoh: Mt.Pleasant will be honoring our Olympians and Olympic trials Finalists. The following Facebook link gives all of the information. 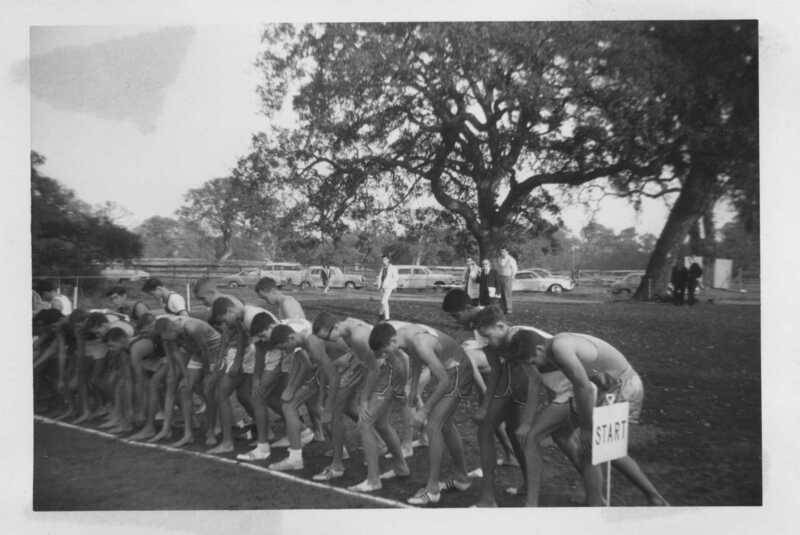 Kiss for a Champion: Back in the 60's & 70's it was not uncommon for Invites to have a "Royal Court" and if you were fast enough to win your your race, along with the medal you were "applauded" by a Princess (and heckled by your teammates) as this M-A runner in '65 found out. Patrick Smith (Carlmont): Carlmont High School (CCS) is seeking applicants for the Head Coaching position for its boys and girls cross country team. 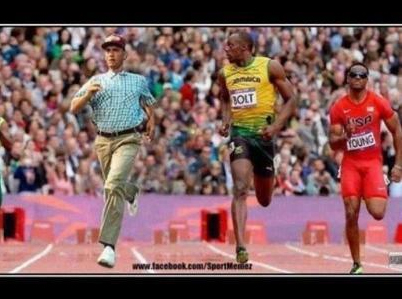 The candidate should have coaching experience and/or competitive running experience. The season runs from late August thru the end of November. The Coach will need to be available from 3:30 to 6:00 Monday thru Friday and some Saturdays for practices and meets. If you are interested please contact Athletic Director Patrick Smith at psmith@seq.org. Open Space Application: Coaches: If you plan on running your teams at either Rancho San Antonio or Fremont Older, beware. You need to have a permit or you may be cited. Print off attached application and FAX in - there is NO COST for the permit. Lynbrook HS example. An on-line permit can be found here. Register into XCStats: New to Lynbrook XC? 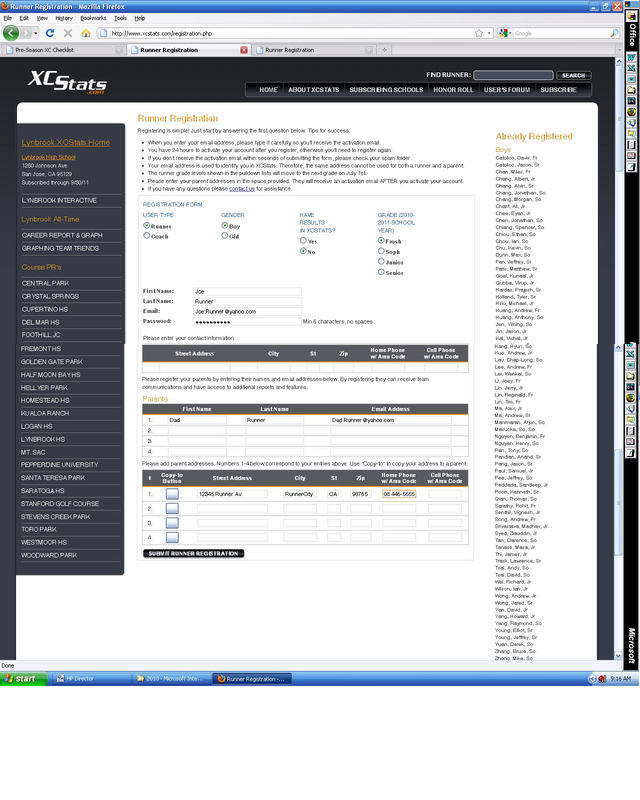 Click on the link to the left to see how to register yourself into XCStats. Stevens Creek County Park: A nice location with a 3.0 mile XC course on it. Good for 7-10 teams to compete on. Course Time Converter: Thanks to XCStats, there are now over 50 courses listed where you can convert one course time to another course. Play with it and see what you think. Crystal Springs Newsletter: Main item is no more fees for rules infractions, but now you need to talk with your principal if you get a ticket. Crystal Springs Schedule as of 08/15/12. Craig Benson: Mercy High School in San Francisco is looking for an assistant cross country coach for the Fall 2012 season. Coaches are expected to have a dedication and passion for running. The season is late August to early November and the coach is expected to be available weekday afternoons and Saturday mornings. This is a stipend position. For questions or to apply please contact head coach Craig Benson at coachbenson@mercytrackandfield.com. 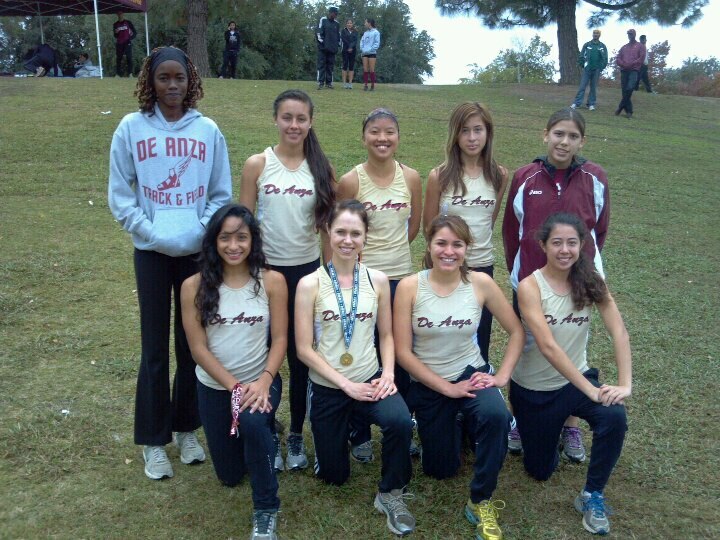 Sarah Stapp: Gunn High School in Palo Alto is looking for an assistant cross country coach for the 2012 season. If interested, please contact Sarah Stapp at sstapp@pausd.org or Craig Blockus at swenrunner@comcast.net. Harker School XC Coach needed: The successful candidate must possess a strong coaching background, and be a highly qualified motivator and communicator. He/she must also provide a vision for the entire program. Prior to beginning work for The Harker School, and as a condition of employment, all employees must go through Live Scan Fingerprinting as well as provide a copy of a negative TB test. Mitty HS: "Men's Assistant XC Coach at Archbishop Mitty High School". Interested parties should contact me: Dan Hodgin; Dan@danhodgin.com 408-550-6326. The position is a paid position. Valley Christian HS: is looking for assistant coaches for 2013 track season to coach hurdles, high jump and assist in other areas. All interested applicants please contact Head Coach Tammie Marshall via email at tmarshall@vcs.net. Results of LGAC's: The Los Gatos Summer All-Comer Meets. Results 08-09. Some LGAC pictures. WR in the 70-74 age for The Weight (73-03) was set on 7/19 by Ed Burke. Video of last mile: Galen Rupp takes Silver for the USA in the 10K. LA84 Foundation XC Clinic: Aug 18th is their final XC clinic at MSAC. 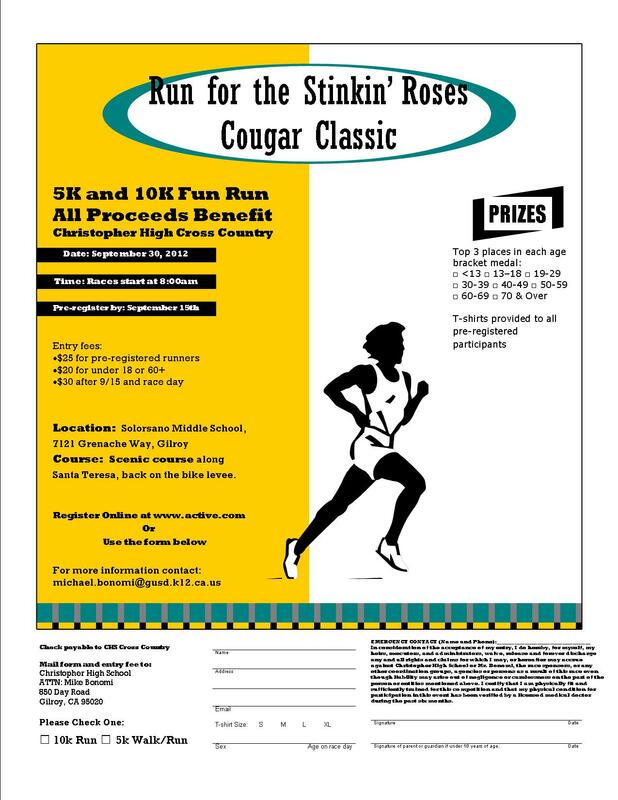 Run For the Stinkin' Roses: Christopher HS Cross-Country team is hosting "Run For the Stinkin' Roses 5K & 10K" on Sept 30th as a team fundraiser. Pat Porter: 8 time US XC Champion dies in a plane crash. 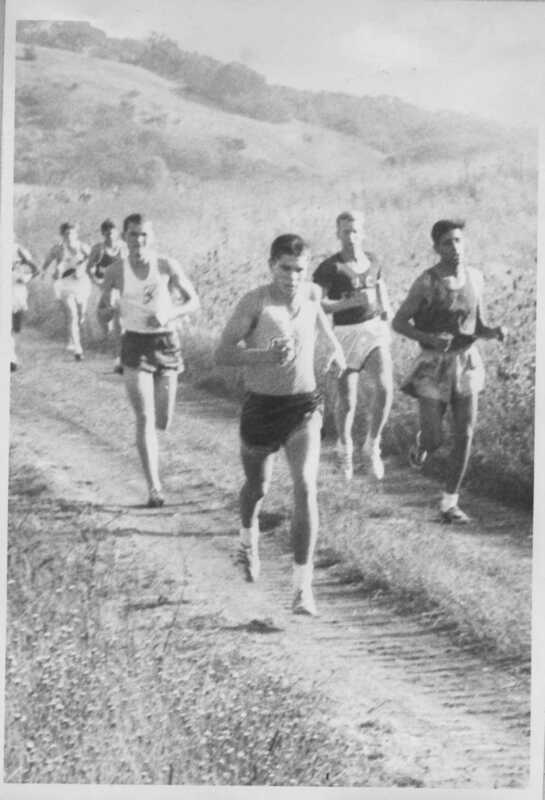 Crystal Springs foto: The year is 1966, the course is the "old" Crystal Springs course (2.25 miles). CCS XC Meet Sanctioning: What meets do and don't need to be sanctioned by CCS? I had this question last year and dropped Steve Filios (CCS) an email and here were his responses. Wharf To Wharf results: lots of familiar names. FOX Athletics Qualifiers: Fox Athletics is sending 6 to Nationals. Michelle Jeneneke - World Juniors Hurdle Gold medalist: It's gone viral - a track video getting almost 7 million hits in 3 days. 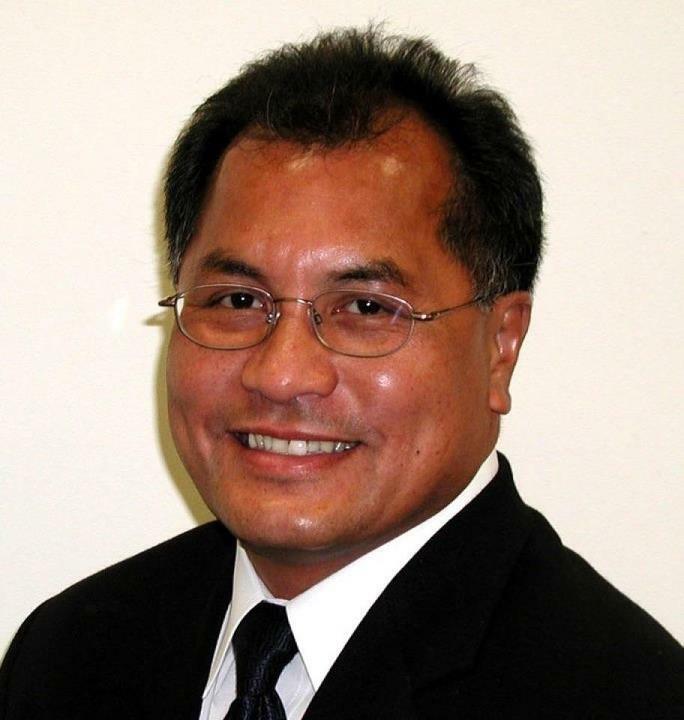 Roland Baza (07-10-12): Roland's Services: Tuesday, July 17, 2012. Viewing from 5-9pm, includes vigil at Colonial Mortuary, Cusimano Family @ 96 West El Camino, Mountain View, Ca, 94040, phone #650-968-4453. July 23rd: Mass- 10:00am, Our Lady of Peace, 2800 Mission College Blvd. Santa Clara, CA 95054, phone #408-988-4585. Gate of Heaven Cemetery, 22555 Cristo Rey Drive, Los Altos, CA 94024. Telephone: 650-428-3730. We should be at the Cemetery by 11:45 AM or sooner, following inturment, Celebration of Life at Ed Baza's house, 310 Beechnut Ave. Sunnyvale, CA 94085. Collage. 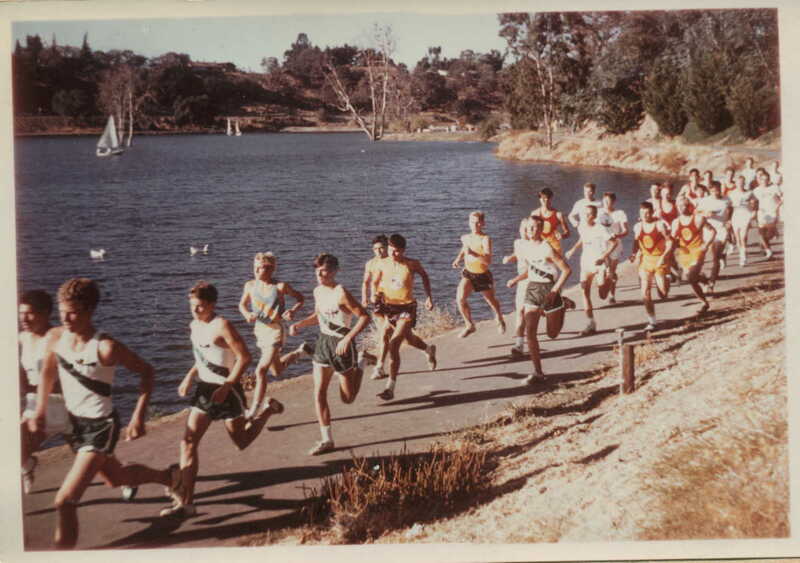 Vasona Park: used to host XC Center Meets as shown by these 1966 photos. Beach Racing: Back in the day (1959 to be exact) they used to have XC races on the beach. CCS Pre-season Team Rankings: Based on individuals input and the computer. 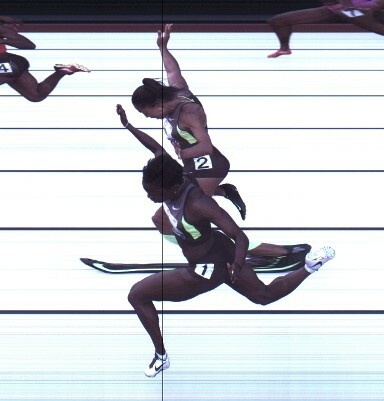 Olympic Trials 100: Dead heat for 3rd place in the Women's 100 between Tarmoh & Felix. 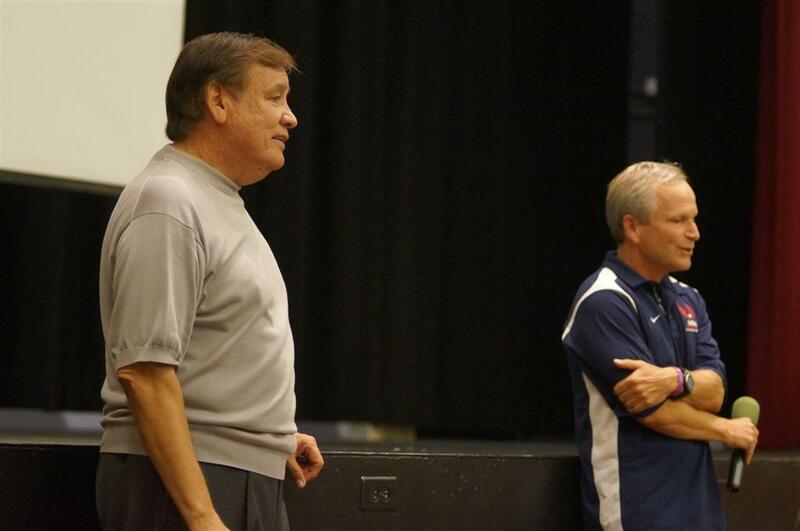 Former Mt View coach Steve Kemp: has a camp for you. Jeneba Tarmoh: NY Times article on the Mt Pleasant grad. Vashti Thomas (MP) also gets in on the OT action. 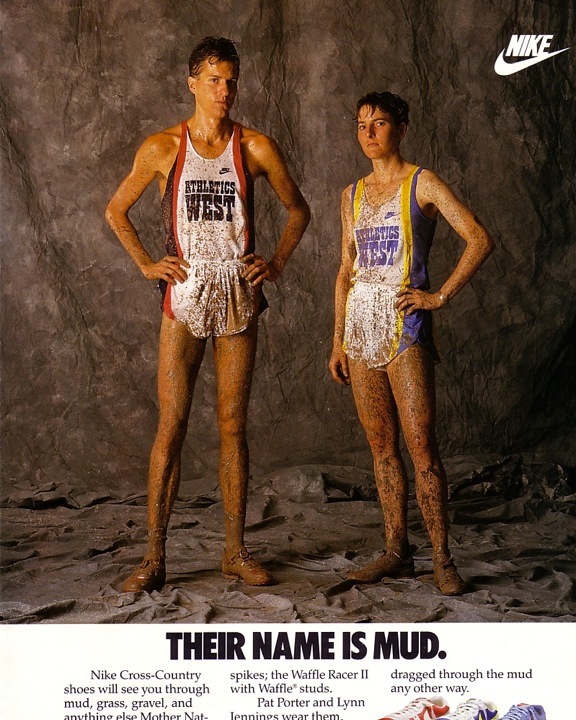 LA84 Foundation XC Clinic: July 21st is their next clinic at MSAC. Lindsay McKee (Santa Teresa): broke Amy Theil's (Fremont Christian) 1998 CCS record in the Hammer Throw by 1 inch, throwing 156-09 at the UCSC Throwers Meet and is ranked #14 in the Nation. LG All-Comer Meets: There are no lights at LGHS due to construction so the meets will start at 4:30 (field) and 5:30 (track). Cost is $7.00 to compete. 2013 Track At-Large Marks: For CCS & State. '52 Olympic Stadium (Helsinki): Me & Paavo Nurmi at the site of the '52 Olympics. Sadoka 120K: Pelathon in Berlin - Leaders & then the Chase Pack. CCS Top 100: Congratulations to the following 126 individuals/teams that made it on to the CCS Top 100 All-Time list. Top 100 updates have been completed. FOX Athletics: The summer season will be an incredible opportunity to both learn and compete! All athletes will learn about proper technique in a variety of events while developing speed and power. Of course athletes will also be in a fun and social summer environment! Events offered will include, sprints, relays, HJ, LJ, TJ, Discus, Shot, Javelin, Hammer, Decathlete training ( we do not offer PV). Summer Season June 4th- Aug. 20th. Practice times: 4:00pm @ LAHS on Mondays and Wednesdays. 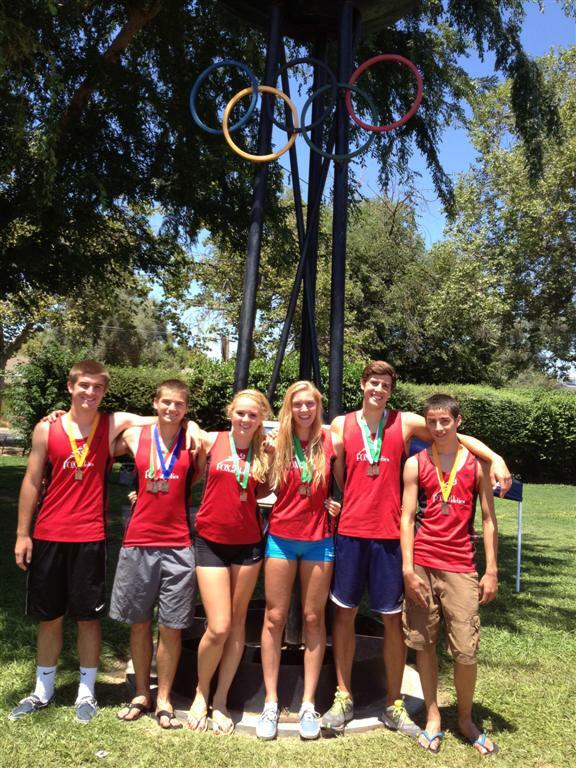 We will attend some Los Gatos All Comers Meets on Thursday evenings as well as the Junior Olympic Circuit. Pacific Association Junior Olympic meet June 16th-17th @ TBA . Regional Junior Olympic Championship June 30th @ TBA. USATF National Junior Olympic Championship June 22nd-June 28th, Baltimore Maryland at Morgan State. INVESTMENT: $350 ** There will be additional fees for uniform purchase, USATF membership, entering any track meet, travel costs. Leland High "Jumps Camp": 4 weeks with 4 days a week of practice starting Monday June 11, 2012 through July 14, 2012. Tri County Running Club: Get in shape, run some races (track and road), and have fun becoming a great runner. Silver Bullets Running Camp: Track is over for 90% of your team so why not start looking at Summer Running Camps. XC Boot Camp: It�s time to lace �em up and continue our journey. For those of you returning to the �FAMILY�, welcome back!!!! For those of you finding us for the first time, this will be an experience you will not soon forget. Bay Area Running Camp: will be held July 23-27 from 8am-12pm in Portola Valley (Woodside Priory School). Team discounts are available for 5 or more registrations from the same school. REGISTRATION INCLUDES A PAIR OF NEW BALANCE SHOES. Don't miss out! Email Dena Evans at dena.evans@gmail.com and/or Albert Caruana at albertjcaruana@gmail.com with any questions. Summer Jump Camp with Derrick Bell: Doing the summer High School jump camp again this year (June 12- July 19) start time 4pm-6:30pm : But we are going to the AAU National in Houston Texas this year if any High school jumper would like to come or just do the six weeks camp to train�both are welcome this year. For more information check the BCP.org site under summer camps and you will find my camp info. If the national meet is what you�re doing remember there will be added cost for travel and hotel. It's What We Do: by Stephanie Claussen, Class of '01. 2012 Track: Still looking for 2012 Track results (GWI, NON,...).